Back in May, MufuChat focused on the new specifications and asked which exam board music teachers would choose. Very early on in the chat, it became apparent that many teachers place value on a lot more than the specification when it comes to choosing an exam board. It’s a very fair point and it got me thinking about the wider service that each board provides. To help music teachers make their decision, I approached representatives from the four boards offering GCSE Music and AS/A-Level Music to answer a few key questions about the service they offer as well as their thoughts about the new specification. I’m expecting that the most interesting responses will come from the question “If Ofqual wasn’t a factor, what would you change about your draft specifications?”, which gives the subject advisors an opportunity to show us their values for music education. I will keep chasing AQA to see if we can get them involved in this series of posts! To keep things fair, each board representative has been asked the same questions, which can be found here. The first person to email all of her answers to me was Marie Jones of OCR, meaning that her answers go live today. Wearing a Musical Futures hat (unfortunately, not literally), I recently spent a couple of days with Marie at the OCR Expos recently and you can read about that experience by clicking here. My ‘first reaction’ to the GCSE specification can be found here and the A-Level one is here. “Again I am a member on a personal level but will engage with board specific queries when appropriate. 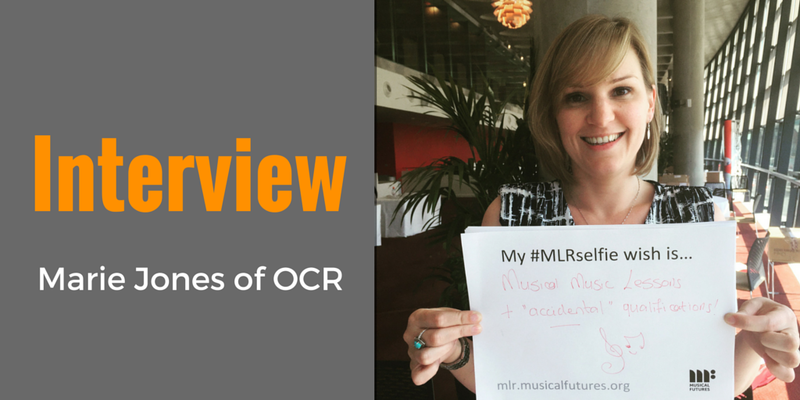 “The vision for OCR music was to be musical, practical, flexible, accessible, and integrated, with clear progression between the stages. We have designed our new draft specifications to cater well to all abilities and tastes, to provide courses that can be personalised to the students. I always chose the OCR GCSE as a teacher/HoD for this very reason. It is equally able to be personalised for lower and higher ability, which I feel is very important. It also allows for very practical, musical, noisy music lessons! This is a strength we have built on for all three of our new draft specifications. We have an emphasis on integration in all three qualifications. The assessments for performance, composition and listening/appraising have to be made separately but the specifications clearly encourage integration during the teaching and learning process. We have designed the new specifications to have a clear progression from each stage to the next. The new Areas of Study are the main way in which we have achieved this. “The opportunity for more practical work in the assessment. Music is a practical subject and as such we should be freer to design qualifications that allow students to demonstrate their knowledge, understanding and skills in a practical mode, as well as a theoretical mode.